n Portugal only some varieties of “castas” are authorized in the Demarcated regions. Each region has its own “Comissão Vitivinícola” to supervise the quality of the wines in various aspects of the cultivation and preparation of vineyards, but also in assuring the quality of the wine, for instance, in its flavour and scent. A grape is the non-climacteric fruit that grows on the perennial and deciduous woody vines of the family Vitaceae. 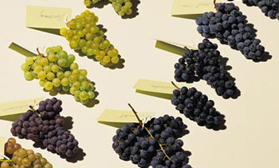 Grapes grow in clusters of 6 to 300, and can be black, blue, golden, green, purple, red, pink, brown, peach or white. They can be eaten raw or used for making jam, grape juice, jelly, wine and grape seed oil. Cultivation of grapevines occurs in vineyards, and is called viticulture.